The Union Label Committee informs and educates members about the products and services we buy and use as consumers. This committee helps to emphasize the importance of supporting goods and services produced by union members under union-won working conditions. And, keeps members informed of union products and their availability in the community. This committee also updates members on product manufacturing that has been moved out of the United States and product boycotts endorsed by the AFL-CIO. The Union Label Committee is hard at work selling Union Made, American Made, Union Printed T-Shirts! These T-Shirts help to remind members to Look for the Union Label on all consumer products and services. NEW! The Christmas Mix & Mingle!! 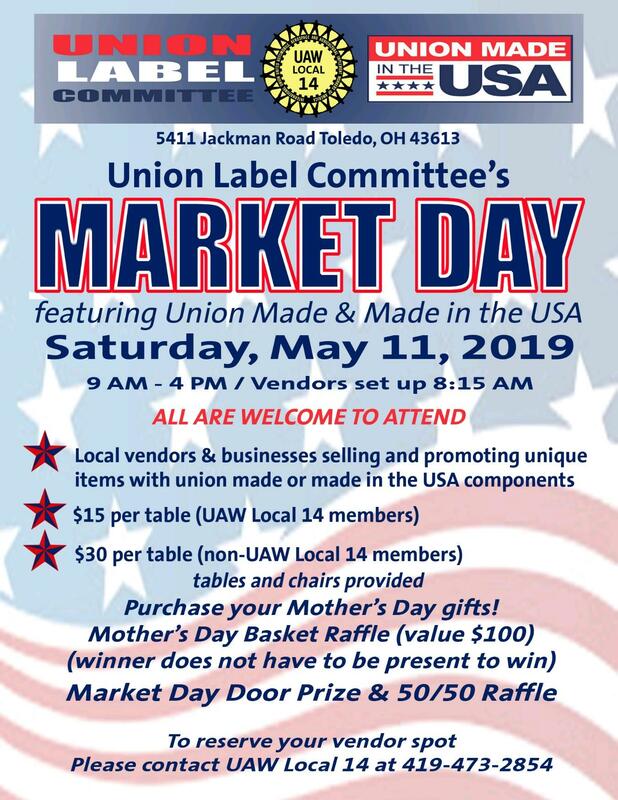 The UAW Local 14 Union Label Committee is partnering with ALL LOCAL 14 COMMITTEES this year to raise funds for the UAW LOCAL14 LAID OFF WORKERS FUND. We are all selling Mix & Mingle Tickets for $10 each and BASKET RAFFLE TICKETS FOR $5 each. See the flyers for details!